nutriFOG®is a proprietary and registered special formulation, offered for pulsFOG® thermal and cold fogger with stainless steel nozzles. It retards premature evaporation of the water and prevents the fertilizer substance from crystallizing*) out prematurely. nutriFOG® contains all the essential nutrients for improving the plants' vitality, thus ensuring a particularly attractive appearance of the treated cultures. The nutrients can develop their full physiological effect due to the added chelating agents. nutriFOG® is suitable for admixing to common plant protection applications, too. 250 ml of nutriFOG®plus 1.5 –2.5 l of water per 1.000 m2 of greenhouse area at an interval of no less than 5 days. Increasing the dosage to 500 ml/1.000 m2 is possible in individual cases. The total application volume of nutriFOG® should not exceed 1.5 l/1.000 m2 per month. If wettable powders are admixed, the concentration should not exceed 80 g WP/l of water. If necessary, add more water. Please observe the dosage on the label of the plant protective product and the instructions of the fogger manufacturer. Start by mixing the treatment agent with water, then add nutriFOG® while stirring. If an inexperienced biocide is intended to use, it is advised to prepare first a small trial solution to check the compatibility. In some rare cases the mixture is not compatible (it will develop a paste). Do not mix nutriFOG® with biocides, which prohibit adding any other chemicals. For combined application with plant protectives, wear gas mask with filter A2-B2-P3 Distribute the fog evenly on the crop while walking backwards. Stationary fogging is only admissible with fan-type foggers or additional fans using a fan with low revolution (less than 1000/min). Machines, equipped with a nozzle system made from brass are not suitable (brass is not resistant to nutriFOG®). Operate and fog only in the evening, avoiding strong temperature drop during the night. Do not enter the treated greenhouse during the period of action of the fog and vent it for one hour before entering. Keep the treatment substance and its residues as well as the emptied Containers and packages away from waters. Fully use up any residual quantities. Dispose of empty packages via the household garbage collection, or rinse thoroughly. After work, wash the hands and all affected skin areas thoroughly with water and soap. In case of eye contact, rinse immediately with ample water. In case of sickness or accident, call a physician immediately ( if possible, present this label to him). Misuse may be detrimental to health. Swallowing is detrimental to health. Store in original Container. Keep out of the reach of children and away from human and animal food. Protect this product from drying out, contamination and sunlight. Keep the Container hermetically closed. Do not store at temperatures below 4°C and higher than40°C. This Information corresponds to the current state of our knowledge and is intended to inform you about the possibilities of application. The product is suitable for the recommended purposes if these instructions for use are observed. Since storage and application of the fertilizer are beyond our control, we shall only warrant perfect quality at the time of delivery. VK-2 Spezial is a water-soluble additive inhibiting the evaporation of aqueous pesticide and disinfectant solutions applied in the form of aerosols. VK-2 enhances the homogeneity, visibility and spraying radius of the droplet fog generated. The evaporation-inhibiting properties ensure that the water droplets carrying the active ingredient retain their original size for a longer time. The evaporation loss is reduced. The improved visibility and spraying radius of the fog produced facilitate uniform distribution in the space and across the surface. VK-2 narrows the droplet spectrum and prevents precipitation of larger droplets in the vicinity of the fogger. The distribution in the treated room is enhanced. 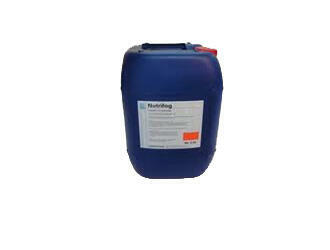 The neutral emulsifying agent contained stabilises the admixed biocide in water with a higher hardness degree. 100-500 ml of VK-2 Spezial + 1.5-3 l of water/1000 m² greenhouse area. The lower the temperature in the greenhouse, the less VK-2 should be used: At 16°C, only 100 ml. The maximum dosage is used with 3 l of water and a room temperature of >21°C. The water portion per volume unit is increased as smaller the greenhouse size. All sizes below 500 m² shall be rated with the max of 2,5 L/1000m² First mix the biocide with water then add VK-2 special. Minimum: The quantity used for spraying in 100 l water should be fogged per 1000 m². Maximum: The quantity used for spraying in 300 l water should be fogged per 1000 m². For the first application, begin with the minimum dosage; then increase as necessary. The flowers of saintpaulia, impatiens, gesneria, begonia, pelargonium and some gerbera species may respond with a certain susceptibility. In such cases, do not apply more than 100 ml/1000m². Do not mix with Saprol (Triforine), Confidor (Imidacloprid), Unden liquid (Propoxur liquid) or Metasystox (Oxydemeton-methyl). Begin by stirring the biocide or disinfection agent into the required volume of water. Wettable powder should first be stirred to a lump-free paste with a little water. Finally add VK-2 to the fogging liquid and stir. Do not prepare more fogging liquid than you actually need for immediate application. In a closed greenhouse, in the evening or at night at temperatures below 25 °C. Take the necessary precautions to avoid condensation on the leaves due to a significant temperature drop. Stationary fogging is only admissible using blowers; otherwise distribute the fog evenly over the crop. (Start at the far end of the greenhouse and walk backwards, spraying uniformly from the chemical tank so that it is empty by the time you reach the exit. When you arrive at the centre of the greenhouse, check that 50% of the tank content has been used up). Do not fog on plants directly. Preferably at a high relative humidity (80% min.). During the day, only with the sky clouded. In the evening, at night. Do not inhale the fog produced. Keep empty containers away from waters. When finished, wash hands and other exposed skin areas using soap. In case of eye contact, rinse with ample water. If you feel sick, or in case of an accident, get medical assistance. Observe the manufacturers' safety instructions. Wear full-scale protective clothing including respiratory filter of class A2B2-P3. Tag-out all treated rooms. Ventilate the treated room for at least 1 h before accessing it without protective clothing. Misuse can cause damage to health. Ingestion causes damage to health. Strictly adhere to the instructions for use. Store in original container and protected from frost. Keep out of reach of children and away from fodder and food. Max. recommended storage period: 6 years. 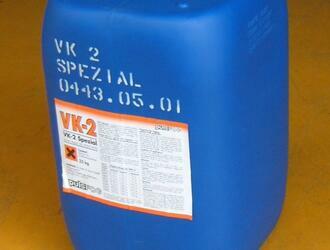 Mixtures of water and VK-2 Spezial can be kept in a separate closed container until the next application. Mixtures with biocides must not be kept for later use! We warrant the proper quality and composition of the product in the original unopened container. Since the actual application is beyond our control, we shall not be liable for lack of success or any damage caused.